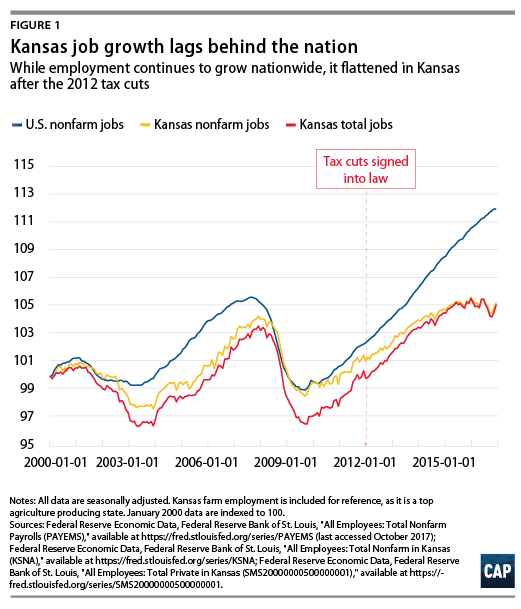 In addition to the same fairytale claims of economic and job growth, which are illustrated by the quotes above, the actual tax plan passed by the Kansas Legislature looked similar to what Trump and congressional GOP leaders now propose. The Kansas tax plan collapsed the state’s three individual marginal income tax rates of 3.5, 6.25, and 6.45 percent down to two rates of 3.0 and 4.9 percent.6 In a similar fashion, the Trump-McConnell-Ryan tax plan would collapse the number of individual brackets from seven down to three, with rates of 12, 25, and 35 percent—with a possible fourth bracket between 35 and 39.6 percent.7 These changes both reduce the progressivity of the respective tax codes and give the biggest benefit to those with the highest income. The Trump-McConnell-Ryan plan would also create a differential between the top tax rates on personal and business income—only with a much larger difference of 10 percent. Just as analysts predicted for the Kansas pass-through tax cuts, the Tax Policy Center predicts that under the “Unified Framework for Fixing Our Broken Tax Code,” individuals will recharacterize wage income in order to qualify for the lower pass-through rate. The center estimates that the pass-through tax cut alone will cost nearly $770 billion.10 And if the differential in the final legislation is larger, the behavioral effect—the shifting of income into pass-through businesses—and the associated revenue loss will likely be even greater. Estimates for the Trump-McConnell-Ryan plan follow a similar pattern. The Tax Policy Center’s preliminary estimates found that in the first 10 years, the plan would lead to a net revenue loss of $2.4 trillion.14 Yet President Trump and congressional leaders have continuously proclaimed that economic growth will outpace any losses, resulting in greatly enhanced revenues—even though no serious economist believes tax cuts pay for themselves. Just like with federal tax cuts in the recent past, the Kansas tax cuts were rolled back on June 6, 2017, over Gov. 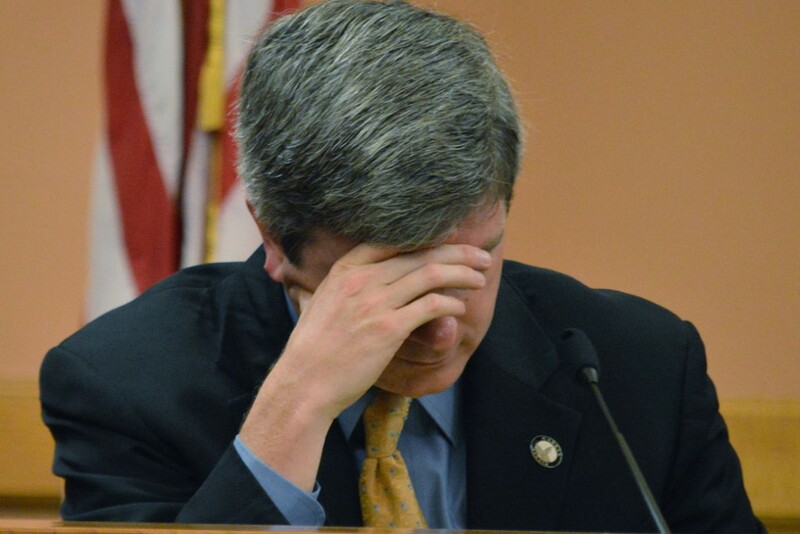 Brownback’s veto, with the support of many Republicans. The exemption for pass-through income was ended and most of the other tax cuts were repealed. At least one of those Republican legislators, along with a number of conservative analysts in the state, are now specifically warning Congress not to repeat their state’s mistake.27 With the reversal of the governor’s veto, the resounding message from Kansas legislators on both sides of the political aisle is clear: Don’t buy into claims that huge, regressive tax cuts will create incredible economic growth and job creation. Alexandra Thornton is the senior director of Tax Policy for Economic Policy at the Center for American Progress. Galen Hendricks is an intern at the Center.